The University of Johannesburg (UJ) will help needy students take the next step towards a tertiary education with the UJ Future Walk in Auckland Park on Sunday, October 18. The event, which is a joint initiative of the University’s Sport and Student Finance departments, aims to raise R3 million towards bursaries for underprivileged, academically deserving students at UJ. By taking part in either the 5km walk or 8km fun run, members of the public will be giving students a chance to pursue and complete their studies for a brighter future. Although there is a National Student Financial Aid Scheme (NSFAS) in place, increased enrolments at universities have meant that many qualifying students are unable to complete their degrees due to a funding shortfall. UJ has been working with the Gauteng Department of Education (GDE) to ensure that UJ raises enough funds to expand the University’s bursary programme, and the Future Walk is their latest joint venture. According to Nolwazi Mamorare, executive director of UJ Student Finance, corporate sponsors have already donated more than R250 000 in cash for the event. However, Mamorare said that they were still a long way from reaching their target amount. Also steering the UJ Future Walk is Nomsa Mahlangu, senior director of UJ Sport. Mahlangu said that student fees could approach R50 000 per annum for certain courses, making it essential to raise as much funding and help as many students as possible. “This is not just about assisting individual students, this is about working to build a stronger, more productive society,” she said. Ms Mahlangu called on the public to support the event and said they could comfortably accommodate 5 000 runners and walkers at the venue. “It’s a chance for the Joburg community to shape up for summer while helping to shape the future of our students,” she said. UJ Sport is in charge of the logistics and general organisation of the event. The event starts and finishes at the AW Muller Stadium on the Bunting Road Campus. A park-and-ride service is available from the Kingsway Campus student parking. Discovery medical aid scheme members will earn Vitality points for taking part in the event. For more information, visit http://www.uj.ac.za/EN/CorporateServices/UJ-and-GDE-Future-Walk/Pages/default.aspx. Enter online at www.entrytime.com before October 14. Tickets cost R145 for the 5km walk (7:00am) and R175 (7.00am) for the 8km run. Alternatively, SMS “UJFUTUREWALK” to 40287 to pledge R20 towards the bursary fund. Author: Coetzee go from Full Stop Communications. 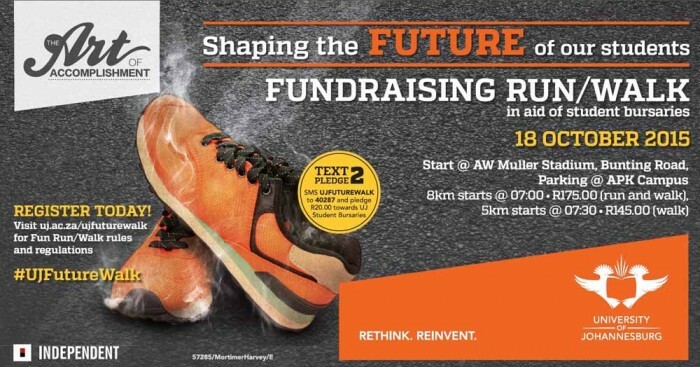 The University of Johannesburg will host the UJ Future Walk – comprising a 5km walk and 8km fun run – at the Bunting Road Campus on October 18. The event aims to raise R3 million towards bursaries for academically deserving but financially needy students.